Welcome! 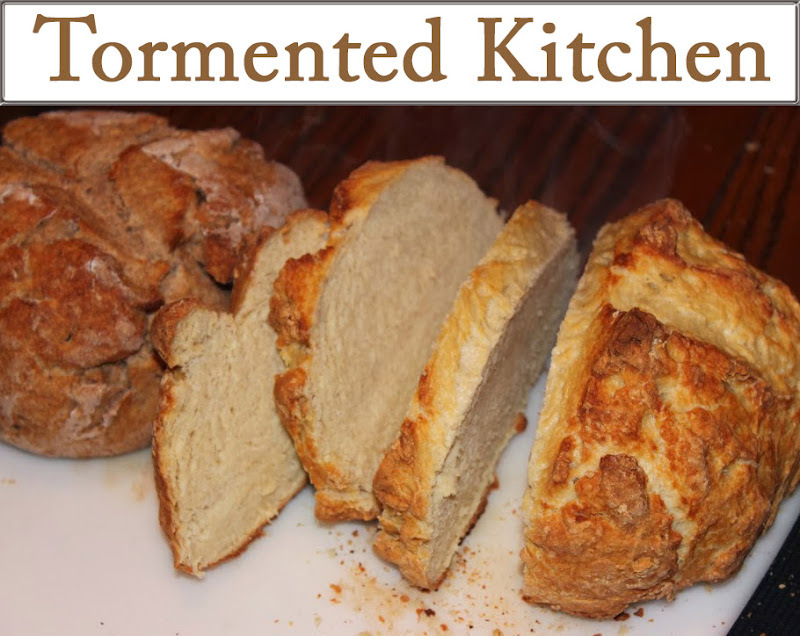 Today Chef Jen-o-wa Kowski-Browski presents for your enjoyment...pictures! Pictures of my attempts at cake decorating. They are not professional. I am not a professional. Hence the variation in the script and squigliness. So first is a cake I made for my parents. 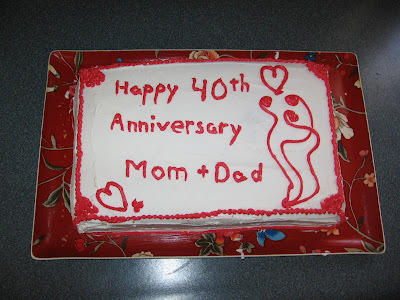 It was for their 40th anniverary. I think it was yellow cake. It definitely had homemade buttercream frosting and strawberry mousse filling. Next is a birthday cake from Eric's first birthday. I used a shaped Wilton cake pan and followed the instructions to decorate it using Wilton supplies. It turned out pretty good. It was yellow cake, no filling, homemade buttercream frosting. 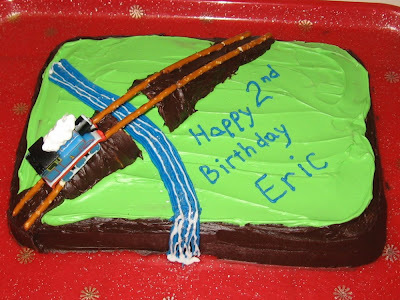 Then third, this was Eric's cake from his second birthday. I was a tad rushed for time, so I used store-bought vanilla and chocolate frosting in a tub. I colored the vanilla frosting using my Wilton coloring. I spread the frosting instead of piping the whole thing. The train is a Thomas candle. I used pretzels as track and ice cream cones to make the bridge. The river and waterfall were made blue icing in a tube, white writing gel in a tube and iridescent edible glitter.